The history of southern cheese straws is a subject for debate. Some say that it can be traced back to the British “biscuit.” While others say the biscotti and hard breads of Italy and Spain regions of Europe. No matter where they originated, the cheese straw has found its home in the kitchens of the south. 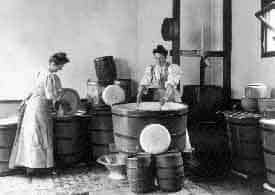 Making cheese straws in the old south was a way preserving cheese in the heat and humidity of the South. They were a staple of Grandmas kitchen until the 50s and 60s when there appeal as a compliment to a good cocktail became apparent. The White House cookbooks from the 1800s even boast a cheese straw recipe. Piped from a cookie press and sliced into lengths commonly referred to as “straws.” We have changed the shape to be able to better package and preserve the shape.